This article is about the now defunct Canadian hockey team. For a potential expansion franchise in Quebec City, see Potential National Hockey League expansion § Quebec City. The Quebec Nordiques (French: Nordiques de Québec, pronounced [nɔʁdɪk] in Quebec French, /nɔːrˈdiːks/ in Canadian English; literally translated "Quebec City Northmen" or "Northerners") were a professional ice hockey team based in Quebec City, Quebec. The Nordiques played in the World Hockey Association (1972–1979) and the National Hockey League (1979–1995). The franchise was relocated to Denver, Colorado in May 1995 and renamed the Colorado Avalanche. The Nordiques hold the distinction of being the only major professional sports team to have been based in Quebec City in the modern era, and one of only two ever; the other, the Quebec Bulldogs, played one season in the NHL in 1919–20. "San Francisco Sharks" redirects here. It is not to be confused with San Jose Sharks. Quebec Nordiques WHA logo. After they were brought into the NHL, they used the logo for six years, soon removing the wordmark and circle in 1985. The Quebec Nordiques formed as one of the original World Hockey Association teams in 1972. The franchise was not one of the eight original teams established when the league was announced on November 1, 1971. The franchise was originally awarded to a group in San Francisco, as the San Francisco Sharks. However, the San Francisco group's funding collapsed prior to the start of the first season, and the WHA, in haste, sold the organization to a group of six Quebec City-based businessmen who owned the highly profitable Quebec Remparts junior team; Marcel Bédard, Léo-Paul Beausoleil, Jean-Marc Bruneau, John Dacres, Marius Fortier and Jean-Claude Mathieu. They were named the Nordiques because they were one of the northernmost teams in professional sports in North America. Quebec City is located at 46 degrees north latitude; Nordiques translated from French to English means Northerners or Northmen. The only WHA teams located farther north were the Alberta Oilers (changed its name to Edmonton Oilers after one season), Calgary Cowboys, Vancouver Blazers and Winnipeg Jets. The Nordiques' first head coach was the legendary Maurice "Rocket" Richard but he lasted two games, a 2–0 loss to the Cleveland Crusaders, and a 6–0 win against the Alberta Oilers. The "Rocket" decided coaching was not his forte and stepped down. The Nordiques' first star was two-way defenceman J. C. Tremblay, who led the WHA in assists in the league's first season and would be named a league All-Star for his first four years in Quebec. The next season Serge Bernier and Rejean Houle joined the Nordiques. In 1974–75 season, they finally made the playoffs with the help of the high-scoring Marc Tardif; the year also saw the debut of Real Cloutier, who would be one of the WHA's stars. They beat the Phoenix Roadrunners and the Minnesota Fighting Saints to reach the finals, where they were swept in four games by the Gordie Howe-led Houston Aeros. The next season saw the squad become a high-flying offensive juggernaut, becoming the only team in major professional history to have five players break 100 points (Tardif, Cloutier, Chris Bordeleau, Bernier and Houle), a mark which still stands as of 2017. The season ended in disappointment as the Nordiques lost to the Calgary Cowboys in the first round of the playoffs, after losing Marc Tardif to injury after a controversial hit by the Cowboys' Rick Jodzio. Despite injuries to Tardif and an aging Tremblay, the Nordiques finally captured the Avco World Trophy in 1976–77 as they took out the New England Whalers and the Indianapolis Racers in five games before beating the Winnipeg Jets in seven, behind Bernier's record 36 points in 17 playoff games. They represented Canada at the Izvestia Hockey Tournament in Moscow, finishing last with an 0–3–1 record. By 1978, the WHA was in crisis, and Marcel Aubut, by then the team's president under ownership of the Carling-O'Keefe Brewery, began checking on interest in the NHL. 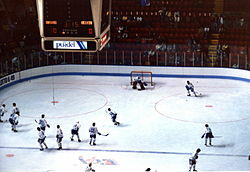 The Nordiques were unable to defend their title and fell in the playoffs to the New England Whalers. The 1978–79 season would be the final one for the WHA and for J. C. Tremblay, who retired at the end of the season and had his #3 jersey retired. As part of the NHL–WHA merger, the WHA insisted on including all of its surviving Canadian teams, including the Nordiques, among the teams taken into the NHL at the end of the 1978–79 season. As a result, the Nordiques entered the NHL along with the Whalers, Oilers, and Jets. Forced to let all but three players go in a dispersal draft, the Nordiques sank to the bottom of the standings. They finished the 1979–80 NHL season last in their division despite the play of promising rookie left winger Michel Goulet. An early highlight to the otherwise dreary season came when Real Cloutier became the second NHL player, following Alex Smart, ever to score a hat trick in his first NHL game. In August 1980 the Nordiques announced that they signed newly defected brothers Peter and Anton Stastny, members of the Czechoslovak national team, since they drafted Anton in the 1979 amateur draft. Their brother, Marian, would follow and also sign with Quebec in the summer of 1981. The following season, led by Peter Stastny's 109-point Calder Memorial Trophy-winning performance, the Nordiques made the NHL playoffs for the first time, but fell in the best-of-five opening round in five games to the Philadelphia Flyers. Led by Goulet and Peter Stastny, the Nordiques made the playoffs seven years in a row. However, due to the playoff structure during most of the 1980s, the Nordiques faced the near-certainty of having to get past either the Montreal Canadiens or Boston Bruins to make it to the conference finals. In 1981–82, despite notching only 82 points in the regular season, they defeated the Canadiens and Bruins, both in winner-take-all games on the road. Their Cinderella run ended when they were swept by the defending champion New York Islanders in the conference finals. The intraprovincial rivalry with the Canadiens intensified during the 1983–84 NHL season culminating in the infamous "Vendredi Saint" brawl, otherwise known as the Good Friday Massacre, during the 1984 playoffs. The Habs scored five unanswered goals in the third period of Game 6 at the Montreal Forum to eliminate the Nordiques. The goals all came after Peter Stastny and Dale Hunter were ejected in the brawl. In 1984–85, Montreal and Quebec battled for the Adams Division championship. The Nordiques finished with 91 points, at the time their highest point total as an NHL team. However, the Habs won the division by three points—solidified by a 7–1 Canadiens thrashing of the Nordiques at The Forum in the final week of the regular season. This was still enough, however, for the Nordiques to garner home-ice advantage for the first time ever as an NHL team. After being pushed to five games by the Buffalo Sabres, they would exact revenge on the Habs in the Adams finals by ousting them in seven games. Peter Stastny clinched the series with an overtime goal in the seventh game at the Forum. They then took the powerful Philadelphia Flyers, who had the league's best record, to six games. The Nordiques warming up before a game in 1986. They won their first NHL division title in 1985–86 (and as it turned out, one of their two in Quebec, the other in the 1994–95 season), but a defensive collapse in the playoffs allowed the Hartford Whalers to sweep the Nordiques in three games. The next season saw more of the Nords-Habs rivalry as the playoff series went to seven games, with the Canadiens coming out on top. In that same season, when Quebec hosted Rendez-Vous '87, an alteration of the All-Star Game to include the Soviet national team, a costumed mascot, Badaboum—a fuzzy, roly-poly blue creature—began entertaining fans at the Colisée with his bizarre dance routines. Badaboum was created just for Rendez-Vous, but generated such a following that the Nordiques made him a permanent fixture at home games. Decline began the following season. The Nordiques finished last in their division — the first of five straight years of finishing at the bottom of the Adams Division — and missed the playoffs for the first time in eight years. The slide continued: in 1988–89 they had the league's worst record. Michel Bergeron, who had coached the team from 1980 to 1987, returned for 1989–90. The season was also highlighted by the arrival of Hall of Famer Guy Lafleur who turned down a lucrative offer from the Los Angeles Kings to come back from a four-year retirement, opting instead to finish his career in his home province. It soon became clear Lafleur's best years were far behind him. "The Flower" managed only 24 goals in 98 games with Quebec over two seasons. The season saw the Nordiques hit rock bottom; they finished with a dreadful record of 12–61–7 (31 points)—still the worst record in Nordiques/Avalanche history (both NHL and WHA), and one of the worst for a non-expansion team since 1967. It was also the second of three straight seasons with the worst record in the league. Michel Goulet and Peter Stastny were traded in 1990, winding up with the Chicago Blackhawks and New Jersey Devils respectively. Despite the stellar play of young forward Joe Sakic, the Nordiques struggled throughout the late 1980s and early 1990s. However, in the 1989 NHL Entry Draft they drafted Swedish prospect Mats Sundin, making him the first European to be selected first overall in the NHL draft. The following year Quebec chose first again, taking Owen Nolan. In 1991, the Nordiques once again had the first overall pick in the NHL Entry Draft. They picked junior star Eric Lindros, even though he had let it be known well in advance that he would never play for Quebec. Among the reasons, Lindros cited distance, lack of marketing potential, and having to speak French. After the Nordiques selected him anyway, Lindros then refused to wear the team jersey on Draft Day and only held it for press photographs. Lindros, on advice of his mother Bonnie, refused to sign with the team and began a holdout that lasted over a year. The Nordiques president publicly announced that they would make Lindros the centrepiece of their franchise turnaround, and refused to trade Lindros, saying that he would not have a career in the NHL as long as he held out. Some of the Nordiques wanted to move on without Lindros, as Joe Sakic commented "We only want players here who have the passion to play the game. I'm tired of hearing that name. He's not here and there are a lot of others in this locker room who really care about the game." Meanwhile, the Nordiques finished with another dreadful season in 1991–92, missing the 70-point barrier for the fifth year in a row. On June 30, 1992, after confusion over whether Quebec had traded Lindros' rights to the Philadelphia Flyers or New York Rangers was settled by an arbitrator, the Nordiques sent Lindros to the Flyers in exchange for forwards Peter Forsberg and Mike Ricci, goaltender Ron Hextall, defencemen Steve Duchesne and Kerry Huffman, "future considerations" which eventually became enforcer Chris Simon, two first-round picks and US$15 million. One of the draft picks was used by the Nordiques to select goaltender Jocelyn Thibault, the other was traded twice and ultimately used by the Washington Capitals to select Nolan Baumgartner. After the trade, Lindros said that his refusal to play for the Nordiques had nothing to do with the language question, and more to do with what he saw as a "lack of winning spirit" in the Nordiques organization. However, in 2016, Lindros said that he simply did not want to play for a team owned by Aubut. The deal transformed the Nordiques from league doormats to a legitimate Stanley Cup contender almost overnight. Forsberg won the Calder Memorial Trophy in 1995, his first season with the Nordiques, and would be one of the cornerstones of the Nordiques/Avalanche franchise for almost a decade with his playmaking and physical presence (albeit being out with injury for periods of time like Lindros), winning the Hart and Art Ross Trophies in 2003. Ricci would give six useful seasons to the franchise before being traded. Hextall was moved after a single season to the New York Islanders, and in return the Nordiques got Mark Fitzpatrick (who would go on to be left unprotected in the 1993 NHL Expansion Draft in which he was claimed by the Florida Panthers) and a first round pick, which the Nordiques used to select Adam Deadmarsh, who would be a key member of the Avalanche Cup-winning teams. Thibault would be traded for Montreal goalie Patrick Roy, after the franchise moved to Denver. During the 1992–93 NHL season, these new players, along with Sakic — now a bona fide NHL All-Star — and the rapidly developing Sundin and Nolan, led Quebec to the biggest single-season turnaround in NHL history. They leaped from 52 points in the previous season to 104—in the process, going from the second-worst record in the league to the fourth-best, as well as notching the franchise's first 100-point season as an NHL team. They made the playoffs for the first time in six seasons, and also garnered home-ice advantage in the first round for only the third time ever as an NHL team. However, they fell to the eventual Stanley Cup champion Canadiens in the first round, winning the first two games but then losing the next four due to inspired goaltending from Montreal's Patrick Roy. Sakic and Sundin both scored over 100 points each, and head coach Pierre Page was a finalist for the Jack Adams Award. The Nordiques missed the playoffs in 1993–94 as they struggled with injuries. After that season, Sundin was traded to the Toronto Maple Leafs in return for Wendel Clark. This trade was controversial for both teams, as Sundin was one of the Nordiques' rising talents, while Clark was the Leafs captain and fan favourite. While Clark performed respectably, he then became embroiled in a contract dispute after the season ended and was sent to the New York Islanders. For the 1994–95 season, Marc Crawford was hired as the new head coach, and Forsberg was deemed ready to finally join the team, but first there was the problem of a lockout. In the shortened season of 48 games, the Nordiques finished with the best record in the Eastern Conference. However, the team faltered in the postseason and was eliminated in the first round by the defending Stanley Cup champion New York Rangers. The playoff loss proved to be the Nordiques' swan song in the NHL as the team's financial troubles increasingly took centre stage, even in the face of renewed fan support over the previous three years. The league's Canadian teams (with the exception of Montreal, Toronto, and to a lesser extent, Vancouver) found it difficult to compete in a new age of rising player salaries. The financial difficulties were even more pronounced by a weakening Canadian dollar. While all NHL teams pay their players in US dollars, the Canadian teams report their revenues in Canadian dollars. The Edmonton Oilers and Calgary Flames were also in danger of being moved, while the expansion Ottawa Senators changed owners before they even played a game. The Nordiques also faced a unique disadvantage due to Quebec City's status as a virtually monolingual francophone city. Then as now, Quebec City had no privately owned English-language radio stations and only one privately owned English-language television station. The only English-language newspaper was the weekly Quebec Chronicle-Telegraph. The Nordiques organization operated almost entirely in French; public address announcements at home games were only given in French. In contrast, Montreal and Ottawa, the other NHL cities with large francophone fan bases, enjoyed significant anglophone support and had fully bilingual operations. The near-total lack of English-language media limited the Nordiques' marketability even in their best years, and made many non-French players wary of playing for them. For instance Eric Lindros refused to sign with the team after they drafted him in 1991, while in 1992 Ron Hextall admitted to being "scared to death" about the possibility of moving with his family to Quebec City. There was also speculation (albeit unfounded) that the ongoing Quebec sovereignty movement and the pending 1995 referendum prompted the NHL to remove itself from the political climate of Quebec at the time, which also surfaced for the Montreal Expos a decade later when Major League Baseball purchased the team as a possible contraction candidate before ultimately relocating them to Washington, D.C. as the Washington Nationals. Aubut asked for a bailout from Quebec's provincial government. However, Premier Jacques Parizeau turned the request down, as few in Quebec were willing to be seen as subsidizing a hockey club that paid multimillion-dollar salaries. Bailouts for Ottawa and Edmonton were also rejected for the same reason. In 1994, The Philadelphia Inquirer reported that Peter Karmanos was in talks to buy the Nordiques and move them to the then under-construction America West Arena (now Talking Stick Resort Arena) in Phoenix, Arizona. The Nordiques later denied that they would relocate and would look to replace the aging Colisée. Finally in May 1995, shortly after the Nordiques were eliminated from the playoffs, Aubut announced that he had no other choice but to accept an offer from COMSAT Entertainment Group, owner of the National Basketball Association's Denver Nuggets. COMSAT moved the team to Denver where it was renamed the Colorado Avalanche. Though the Nordiques franchise and Aubut never lost money on the team, Aubut feared losing money and sold the team before the possibility became a reality. Maintaining their momentum from their successful last season as the Nordiques, the Avalanche won the Stanley Cup in their first season after the move, and added another in 2001. They would also win their division every year in their first eight years in Denver for a total of nine consecutive division titles, the second-most in the expansion era. The year after the Nordiques moved to Denver, the Winnipeg Jets followed them to the United States as the Phoenix Coyotes. The Jets, who were based in the NHL's second-smallest market, were in the same situation as the Nordiques—solid fan support offset by mounting financial difficulties. Afterward, the NHL implemented the Canadian Assistance Plan, a revenue-sharing agreement that saw the league provide financial support for the Senators, Flames and Oilers in order to ensure they would stay in Canada and protect the NHL's lucrative Canadian television contracts. While the NHL would return to Winnipeg in 2011 when the Atlanta Thrashers would relocate to become the current Winnipeg Jets, Quebec City remains without an NHL team after losing out to Las Vegas on an expansion team in 2016. The last active NHL player who played for the Nordiques was Adam Foote who, on April 8, 2011, announced his retirement after the 2010–11 season. Foote played 16 years with the Nordiques/Avalanche franchise over two stints (1992–2004 and 2008–2011). The last active player in any league was Martin Rucinsky, who announced his retirement after the 2014–15 season while playing in the Czech Extraliga . Before the decision was made to move the Nordiques to Denver, Aubut had decided to change the entire look of the team in the event he was able to attract enough financing to play in Quebec for the 1995–96 season, though because of missing an NHL deadline, the change would have not been in effect until the 1996–97 season. The Nordiques would have abandoned the blue, white, and red palette they had worn throughout their history in favour of a teal, black, and navy scheme. The team would also have abandoned the "igloo holding a hockey stick" logo they had used for their entire existence in favour of a fierce looking siberian husky, with "NORDIQUES" in grey block letters below it and the "I" in the team's name fashioned to look like an icicle. These designs were published in local papers before the team ultimately decided to move. The Nordiques had planned on using this logo if the team had stayed in Quebec beyond the 1994–95 season. The corresponding home (bottom) and away (top) uniforms, which reflected the new logo and colour scheme the team would have adopted. 1Season was shortened due to the 1994–95 NHL lockout. After the move to Denver, the Avalanche returned all four of these numbers to circulation. Note: This list does not include selections from the WHA. These are the top-ten point-scorers in Quebec Nordiques history, combining NHL and WHA totals. ^ Gary Miles (May 26, 1995). "Nhl's Nordiques Sold, Moving West To Denver Comsat Entertainment Group Bought The Team. Quebec Had Refused To Fund A New Hockey Arena". The Philadelphia Inquirer. Archived from the original on August 10, 2014. ^ "WHA - The Teams". WHAHockey.com. Retrieved May 28, 2015. ^ Hochberg, Len (1996-06-08). "Lindros Trade Fills Avalanche's Cup". The Washington Post. Retrieved 2016-12-26. ^ Wharnsby, Tim (2013-10-17). "Joe Sakic thriving in role as Avalanche exec". Canadian Broadcasting Corporation. Retrieved 2016-12-26. ^ "Sakic speaks out ... Nords' star says players want Page to deal Lindros". The Hamilton Spectator. Canadian Press. 1991-10-30. p. E2. ^ Eichel, Matt (2008-05-25). "Joe Sakic: NHL's All-Time Greatest Leaders Part I". Bleacher Report. Retrieved 2016-12-26. ^ Marin, Christian (2014-08-22). "NHL captains who were stripped of the "C"". The Sports Network. Retrieved 2016-12-26. ^ Shane McNeil (June 17, 2012). "50 Years of the NHL Draft - The Eric Lindros Saga". The Sports Network. ^ Dillman, Lisa. (July 1, 1992). "Lindros Goes to Flyers : Hockey: Arbitrator upholds Philadelphia's trade, rather than the New York Rangers' deal". Los Angeles Times. Retrieved February 4, 2013. ^ Dickey, Jack (2016-11-14). "The canary in the coal mine, Eric Lindros, at long last, goes into Hall of Fame today". Sports Illustrated. ^ "Controversies behind him, Lindros now one happy camper". ESPN.com. Retrieved 2016-11-10. ^ Parrillo, Ray (June 25, 1992). "Hextall Rooting Against Flyers In The Fight For Lindros The Goalie Could Be Part Of The Flyers' Trade Package. His Agent Says He Wants No Part Of Quebec". The Philadelphia Inquirer. Philadelphia Media Network. Retrieved April 6, 2011. ^ Rosen, Dan (June 22, 2016). "Las Vegas awarded NHL franchise". National Hockey League. Retrieved June 22, 2016. ^ "Champion says goodbye! Hockey forward Martin Rucinsky retires at the age of 44". Novinky.cz (in Czech). Retrieved 16 July 2015. ^ "Throwback Thursday: New look for Nordiques, if they stayed in Quebec | The Hockey News". The Hockey News. The Hockey News. 23 February 2017. Retrieved 22 April 2017. Wikimedia Commons has media related to Nordiques de Québec. CBC Archives CBC Television on the dying days of the team from 1995.